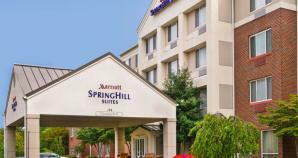 This newly renovated SpringHill Suites Herndon Reston hotel is located in the High Tech Corridor of Northern Virginia just 5 miles from Washington Dulles International Airport, minutes from the Reston business district, and near the Wiehle-Reston East Metro Station. Each hotel suite in the Reston VA hotel is innovatively laid out, stylishly furnished and smartly designed to give business, government and leisure travelers the flexibility needed to work efficiently and relax comfortably. Guests enjoy new hot and healthy breakfast options and comfortable suites appointed with mini kitchenettes, separate work spaces and complimentary internet access. Our IAD Airport hotel provides easy access to the Reston Town Center, downtown Herndon and is only 20 miles from the historical landmarks of Washington D.C. We’re proud to announce that the SpringHill Suites Herndon Reston has earned the prestigious ENERGY STAR label from the EPA for its efforts to protect the environment. Additional Metro Info: Complimentary Metro & Airport Shuttle Service! Save time and money with our complimentary shuttle service available 7 days a week from 7 a.m. to 11 p.m. to and from Washington Dulles International Airport, the new Wiehle-Reston East Metro Station on the Silver Line, and within a 4 mile radius of the hotel.